Our 15 L Unbound Series™ Soft Cooler Pack is small enough for a trip to the park, yet durable enough for the backcountry. Our insulated, waterproof backpack keeps your favorite food and drinks chilled upon arrival each and every time. Load up with your favorite food and drinks and keep them cold for up to 48 hours. Dry storage pockets keep dry things dry and side pockets give you a nice place to stash keys, phone, your Hydro Flask bottle, or other essentials. Which Hydro Flask bottles fit into the side pocket? 48 hours cold. 48 oz light. Our unique cold-retaining technology has thicker insulation in the base where cold is most susceptible to loss. Designed to be lightweight, Smart Insulation keeps your items cold for up to 48 hours. Our coolers feature a True Access hinged top for an easy to access and easy to clean interior. 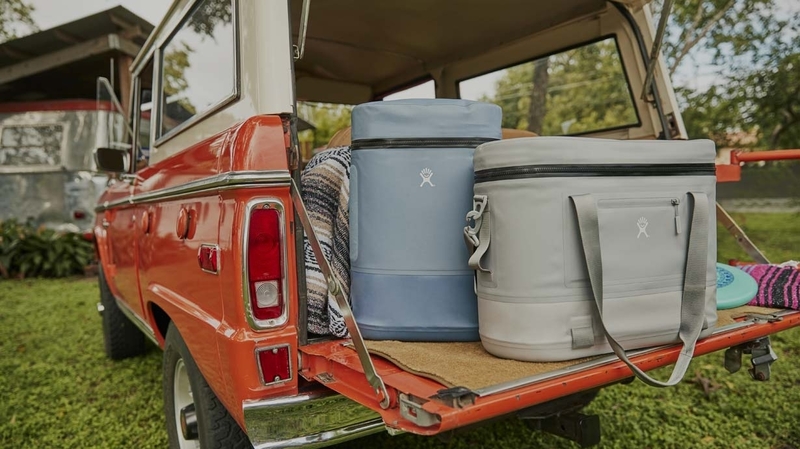 Hydro Flask Unbound Series Soft Cooler Pack, Hydro Flask Unbound Series™ Soft Cooler Tote, Tag Along Small Bottle Sling, and Tag Along Large Bottle Sling carry a 5-year limited warranty against manufacturer defects. How many cans can this hold + ice?